These large members of the bat family have a wingspan of up to 1.5 metres, making them one of the largest species of bat in Australia. 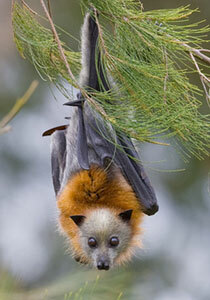 Grey-headed flying foxes live in large, noisy colonies with up to 10,000 animals. They spend the day roosting in trees and the night looking for food. They mainly eat fruit, nectar and pollen from a wide range of trees. They have an important role to play in the environment by pollinating trees and spreading seeds a long distance in their droppings. At breeding time, the females give birth whilst hanging upside down and then hold the babies in their wings. The mum carries the baby around while she flies for the first few weeks, then they are left with other babies in a camp until they can fly at about 3 months of age. Grey-headed flying foxes are found along the east coast of Australia and their numbers are dropping mainly due to habitat loss. Are there any other interesting facts that you would like to share about grey-headed flying foxes?